One of my best resources for finding new clothes comes from going to the nicest neighborhoods in a metro area (in my case, usually Des Moines) and finding the nearest Goodwill or other secondhand clothing shop. That’s where I begin almost all of my clothes shopping. Why do it this way? Simply put, people in nice neighborhoods seem to be far more likely to get rid of items for very minor reasons than people in other areas, and like most of us, they’ll simply find the closest place to drop those items. Thrift shops and secondhand shops in upscale neighborhoods are the beneficiaries of this, and they’re often loaded with wonderful items. Here are some tactics for getting the most out of these stores. First, do some scouting. If you go to the Goodwill closest to the nicest neighborhood in your area and it doesn’t suit you, it does not mean this entire idea doesn’t work. 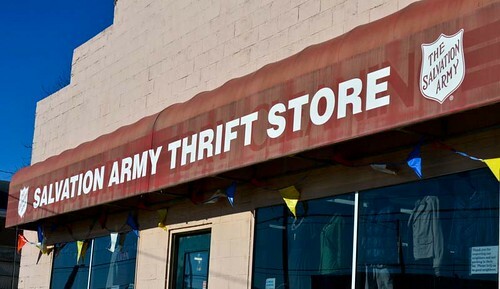 Thrift stores and secondhand stores often operate on widely varying policies. Start with that store in the relatively ideal location, but cast your net a bit wider. Look at all of the thrift shops near (or within) most of the nicer neighborhoods in your area. What are you looking for? You’re looking for good quality and low prices. Finding a thrift shop or a secondhand store with a great balance of the two is well worth your time and effort, because it will be something you can draw on for a long time. Second, widen your vision a little. Don’t completely disregard a secondhand shop because they don’t have the perfect item on the shelves at that moment. The wares at a good secondhand shop or thrift store rotate surprisingly quickly. Instead, look for items that are close to what you’re looking for. Are there items in your size that you might not necessarily pick? Are there items in sizes close to yours that you might otherwise buy? Are there other items of interest in the store? Are these items priced reasonably considering they’re from a secondhand store or a thrift store? These are indicators of the potential of the store to have items that you’d like to buy in the future, which I consider to be more important than items I want to buy right now. I’m more likely to go back to a store that has 50 items that are close to what I want than a store with two perfect items and nothing else. A final tip: do this with a friend. Usually, social shopping is a bad thing, as people tend to talk each other into purchases. However, I’ve found the opposite effect is true when going thrift shopping. For starters, if I have a friend that’s excited enough about thrift shopping to spend hours jumping into various thrift stores and secondhand stores with me, they’re not going to be the type that spends money recklessly. That person is going to be at least as conservative with their dollars as I am, which is just who I want to shop with. Given that, the shopping companion would also make a strong second pair of eyes, helping you to see stuff that you might not otherwise notice. This is incredibly valuable when scouting stores, as every set of eyes helps. Not only that, doing this with a friend makes it a social occasion (and a rather fun one) instead of just a shopping trip. A friend that is willing to pack some sandwiches and spend the day hitting thrift shops with you is going to be a pretty good person to hang out with. There are fantastic deals all around. All you have to do is find them.